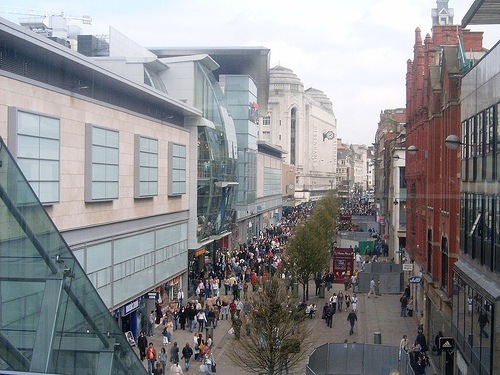 London and the South East have accounted for a national increase in shoppers during April 2008 according to Experian’s latest Retail Footfall Index. The survey shows a 0.1% rise year-on-year and a 0.9% increase between March and April 2008. Good weather during April (I didn’t notice, Ed) and the timing of Easter are also credited with the small apparent upswing in shoppers. Despite slightly higher shopper numbers than expected in April, the outlook remains gloomy for the retail sector. We’re not only seeing a record number of profit warnings (22 so far this year from the FTSE General Retailers Index), but an alarming number of retail companies are also falling into administration. Data also released this week by the British Shops and Stores Association (bssa) revealed disappointing Easter trading among reatilers, down 0.2% during Q1 compared to the same period last year. There seems nevertheless to be a polarisation of performance according to bssa figures. The best performing retailers (45% of the total) showing a rise in performance of 13.4%, while the remaining 55% saw an average percentage decrease of -11.4%. This data suggests that rather than recession, perhaps there’ll simply be a shakeout on the high street as weaker players find less support from the credit cards of carefree shoppers.